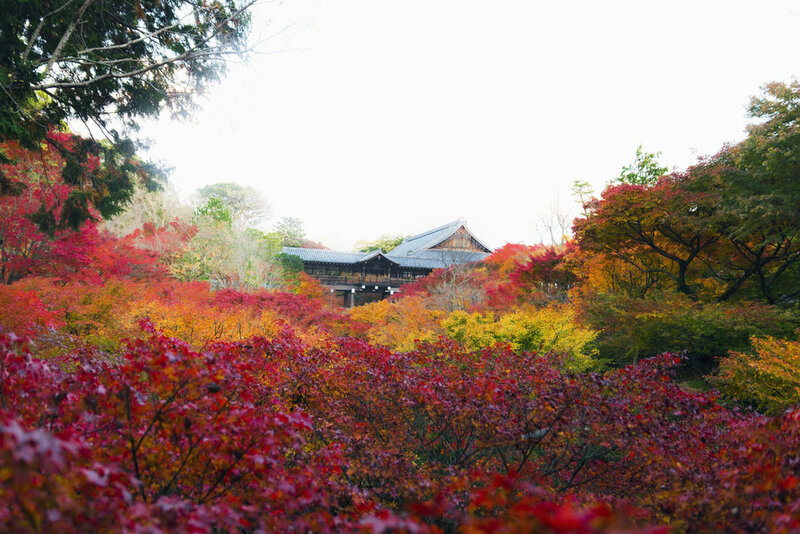 The best season to see Kyoto? Fall, especially if the leaves are at their peak. I’ve been fortunate enough to visit Kyoto during this season a few times and it’s absolutely amazing. 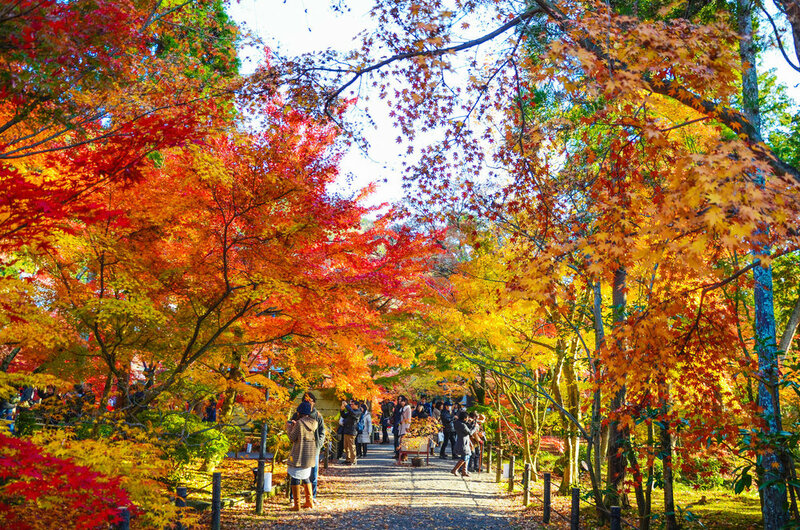 Japan’s cherry blossoms tend to get all the attention, but being amongst the colorful leaves in late November is one of Japan’s most beautiful, and probably underrated, sights to see. Basically, it’s like being surrounded by a painting. Describing the fall leaves around Eikan-do Zenrin-ji as beautiful is an understatement. The breathtaking rainbow color combination is really vibrant and such an incredible sight to see. I’ve seen the leaves here in both day and night, and both times they blew me away. It gets pretty crowded, understandably so, but it’s completely worth the wait and the cost of about 600 yen to enter. The line at night starts on its northern, Shogaku-in Temple side for the night viewing. We waited for about a 1-1.5 hours which was a small price to pay for this incredible sight. Kiyomizu-dera’s fall leaves are beautiful in the daytime, but their biggest impact is at night. A line forms down Matsubara-dori street [MAP], one of the central streets that lead up to the temple’s entrance. It can get pretty long but it moves pretty quickly. We lined up at around 6PM and were in around 30 minutes later. It’s not free but will only cost a few hundred yen. The areas around the main stage of Kiyomizu-dera become an impressive orange, with a tunnel of the colorful fall foliage covering the walk along the path after it. Towards the end, bright red leaves frame the tower and also reflects over a small lake. This light up is completely worth it and a must for anyone in Kyoto during that time. One of the more underrated shrines in Kyoto for sightseeing is Kitano Tenman-gu. Two reasons: One, their Tenjin-san flea market - which I wrote a little about here - that extends for blocks and blocks on the 25th of each month, and two, their maple tree garden in the fall that extends around the temple itself. They have an illuminated night event which I haven’t seen, but their daytime views are nothing to overlook. Colorful walks throughout their pretty extensive garden, plus some green tea and Japanese snacks to go along with it. It’s also less crowded as other popular areas which is a huge plus. The bamboo forest is what Arashiyama is most known for but there are some nice fall colors that can be seen as well, especially on the mountainside next to the river. There’s no entrance fee or anything, just walk the riverside and enjoy the view. The Hozugawa-kudari boat ride is also a good option as it’s a traditional boat ride down the river where more fall foliage can be seen. If you’re interested, I talked a little bit about the ride here. The view from Tsutenkyo Bridge, a 100 meter long landscape of lush, fall colors is one of the more popular sights in the city during this season. While we only made it to Tokufu-ji just before their early closing at 4:30PM, I was able to catch a glimpse of the bridge’s view. It’s definitely something to see as the bridge puts your view just above the treetops..
It’s the golden pavilion that attracts everyone to Kinkaku-ji, but fall is an especially nice season to visit because there are pretty fall colors to be seen. There’s a bunch around the temple’s grounds with most of them on the opposite side of the pavilion where everyone stands to take photos. There are also nice, colorful combinations that appear along the path after the golden pavilion area. No one can go wrong with any of these places. There’s a lot more in Kyoto as well, but out of the ones that I’ve seen personally, I enjoyed these the most. There’s not a lot that can rival the cherry blossoms in Japan, but their fall leaves just might.